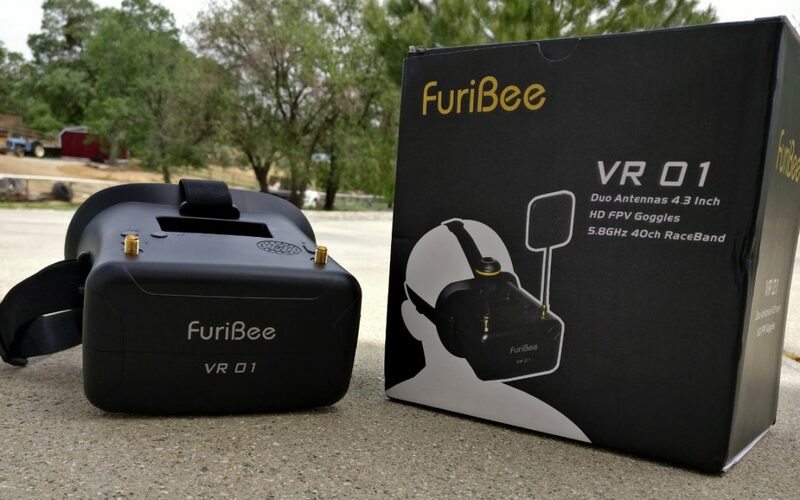 When Gearbest offered to send us the FuriBee VR01 goggles for review, I was a bit hesitant. 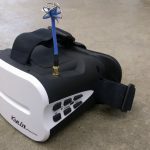 This is because a few months ago we had reviewed another low-end offering on the FPV goggles market – the KDS Kylin Vision. While the KDS goggles had a few problems, I found them to be a great entry level option for pilots who wished to try the hobby out without investing too much money. While the FuriBee goggles look very similar to the KDS goggles at a glance, they are actually very different. These goggles are very comfortable, especially compared to other budget goggles. One thing no spec sheet can really describe is the ergonomics of a pair of goggles. This is one area that I found the KDS goggles severely lacking in, for example. They had hard plastic nosepieces which did not fit my nose properly and were extremely uncomfortable. I am glad to say that the FuriBee VR01 goggles do not have any problems like this. They fit my face fine with all parts of the goggles that touch my face being padded. 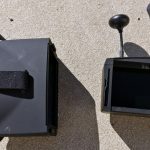 I did notice a little bit of light leakage out of my peripherals – this could probably be fixed with some thicker foam if you are feeling clever. Either way – the important part is that I feel perfectly fine wearing these goggles for long periods of time. I wasn’t as impressed with the actual feel of the goggles. They are made from a thin plastic that feels cheap and fragile to the touch. I’m sure the goggles are fine durability-wise, but I did prefer the soft-touch rubber of the KDS goggles to the thin plastic we see here. 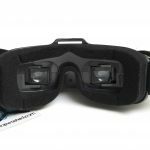 The FuriBee goggles do not come with an integrated battery, or any battery at all for that matter. 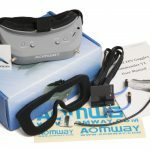 Instead, the goggles come with a power cable and support for a wide input voltage range. At first, I was put off by this as I feel asking beginners to buy their own goggle batteries just adds unnecessary complexity to getting into the hobby. In practice, however, I simply soldered an XT-60 connector onto my goggles and use a flight battery to power them. A 1300mAh 4S battery should power the goggles for more than 12 hours. In my opinion, the two 5808 RX chips set-up in a diversity configuration is the big selling point of these goggles. 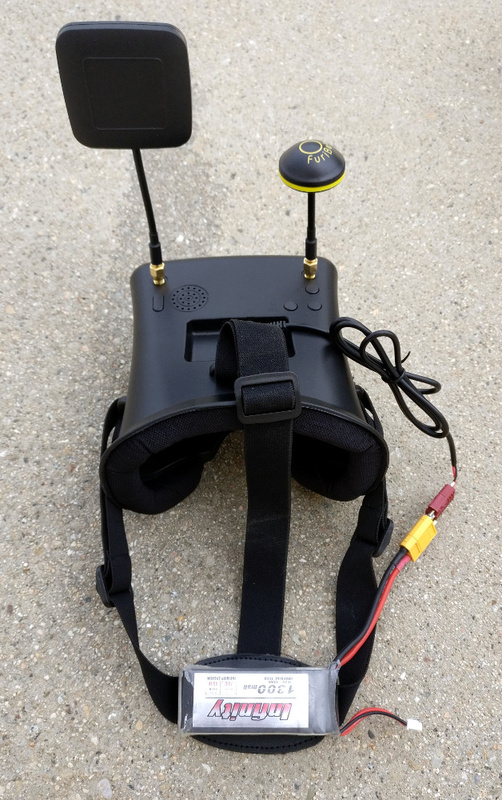 This is a feature that most midrange goggles do not even come with but is a big help in getting great video reception in places with a lot of RF noise – like at most FPV races. The goggles come with a pair of circularly polarized antennas. One is a 14dBi directional patch antenna, and the other is a 4dBi omni-directional. 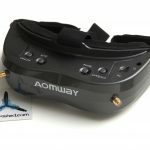 I find it amusing that just a year ago I bought just such a pair of antennas for another quadcopter build I was doing for $45 – near the price of these entire goggles! The controls for the goggles couldn’t be easier to use. There are four buttons. The big one marked “S” activates the autoscan feature, which iterates through the 5.8GHz band and stops on the first channel with good reception. The “SRC” button allows you to switch between the AUX input and the internal 5.8GHz receiver. The other two buttons allow you to individually select the band (“B”) and channel (“CH”) you are receiving on. All bands are supported, including race band. When you select a band either manually or through the scan feature, it is saved in an internal memory and recalled every time the goggles are power cycled – until you change it again. All of the selection information as well as the scan progress is shown on-screen inside of the goggles. Overall, I found this interface very refined. Here is the goggles assembled and ready for use. The antennas are included. I mounted a flight battery to the back of the headstrap with velcro. The screen resolution is probably the biggest disappointment of these goggles. The 480x272px has less than half the pixel density of comparable goggles that are a similar price range. It’s worth keeping in mind, though, that our FPV gear is putting out low resolution analog video feeds. For this reason, resolution matters less than you might think. I spent the last two weeks flying with these goggles and never noticed the lack of video quality over my Dominator V3s. While we’re on the topic of the screen, I wanted to bring up something unique about the fresnel lens used in these goggles. 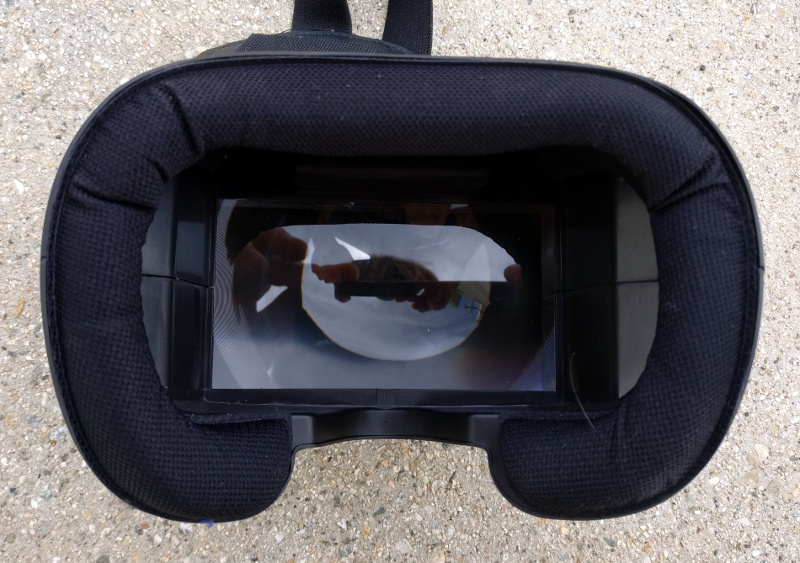 Unlike many FPV goggles on the market, this fresnel lens offers a fairly narrow field of view. This cuts down a lot in immersiveness but is a real godsend when flying my miniquad. This is because a narrow field of view makes it easy to keep everything in view at all times. I would say these goggles are the closest product I’ve flown to my Fat Sharks in the headset format. The headset uses a dual-antenna set-up instead of a diversity set-up. What this means is that both of the antennas are wired together into the receiver chip. This actually lowers overall gain in many cases but does help reduce multipath interference somewhat. We would recommend using two omni-directional antennas with this headset, though, as the traditional advantage conferred by one directional antenna does not apply. Check out our antenna theory article if you are interested in the difference between diversity and dual antenna. So how did the goggles actually perform during my time using them? Excellent! With the highly direction 14dBi patch antenna I was getting tremendous downrange video range with very little static. My radio control system cut out once before the video did, for example. As you fly near the limits of range, the goggles go into static instead of a blue screen; as they should for FPV purposes. Color reproduction on the default screen settings was fantastic. The colors are far more vibrant than those on my Fat Sharks but are comparable to other LCD headsets I have used. Latency is almost non-existent, just like it is with every other headset I’ve used equipped with RX5808 receiver chips. All told, I could definitely see myself using these goggles as my main goggles for flying. I will likely continue to use my Fat Sharks but it’s getting to the point that I’m doing so only to justify the expense of those goggles. I also still prefer their portability to headset-style goggles. 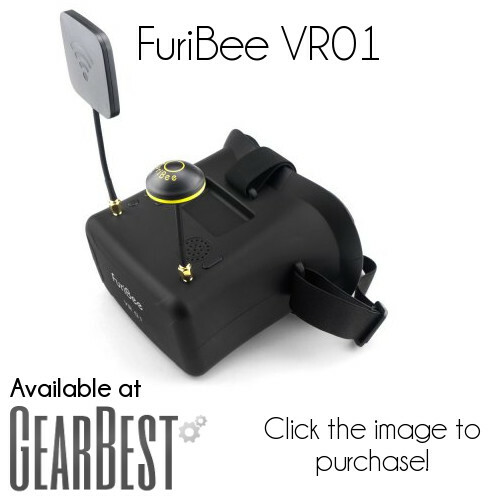 I would say I’ve found a new recommendation for the low end FPV goggle market with the FuriBee VR01 goggles. While the specs for these goggles might not be as great as other options, they have the features that count: low latency RX5808 receiver, dual antennas, comfort and a great battery life when paired with a flight pack. These goggles are a fantastic blend of features, comfort and cost. We want to once again thank our friends over at Gearbest for allowing us to try out this product. Click on the link below to check it out!